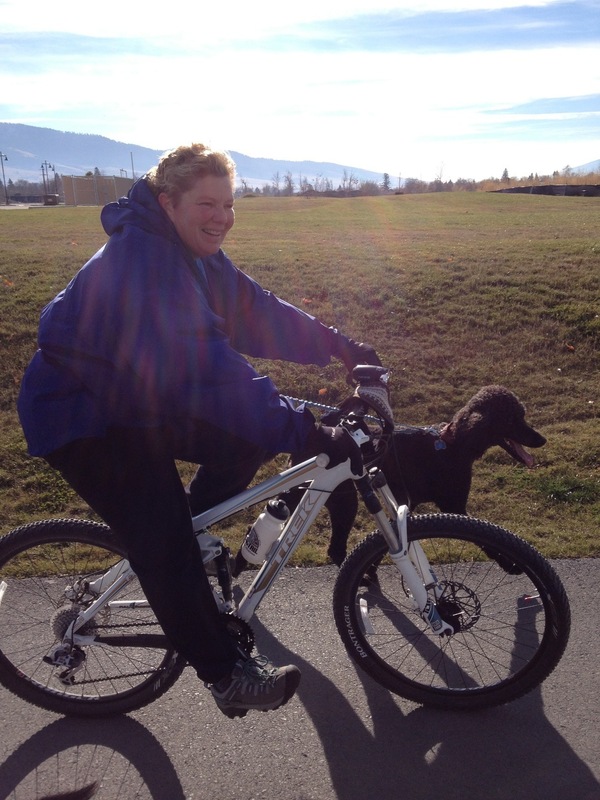 Last spring, not long after we bought new mountain bikes, we started taking the dogs on bike rides for exercise. The four big dogs need a lot of exercise. Bicycling with them is a great way to give them really good exercise in a short amount of time. 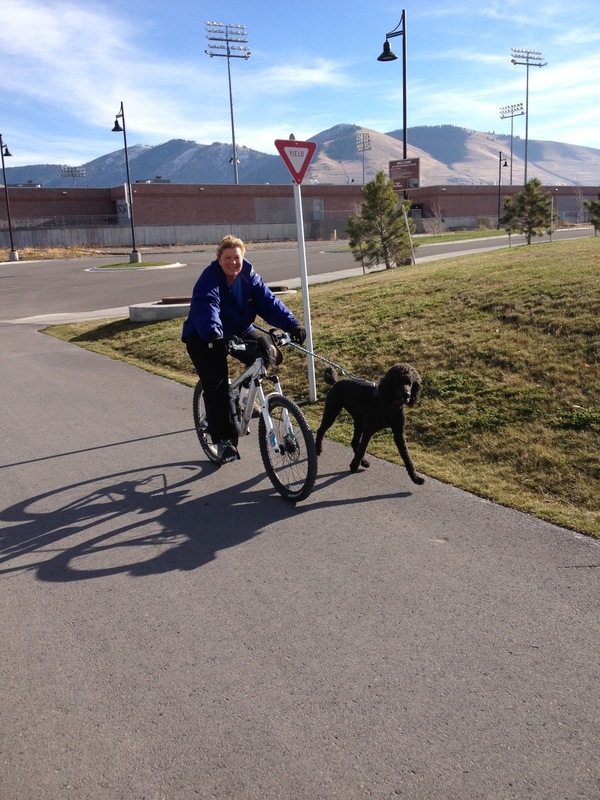 But biking with dogs isn’t always all that easy. 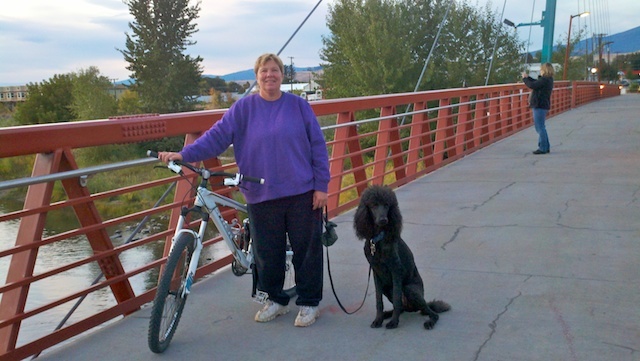 We would take them one at a time—I just rode along while Renee would take the dog on a long leash. I didn’t have the nerve to ride one-handed like that. So I started looking into other options so that I could take a dog too. We decided to try the WalkyDog. This device has a bracket you attach to the seatpost of the bike. The leash itself is a metal bar with springs inside for shock absorption. It has a quick release so it is easy to attach and detach from the bracket. Once all set up, you can ride along like normal (while paying extra attention to the dog of course) and the dog can run alongside the bike. He can’t get ahead or behind the tires, although he can get pretty close. 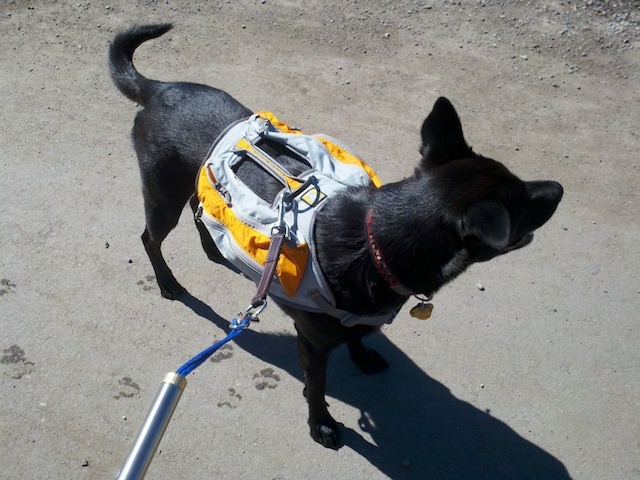 When the WalkyDog arrived, we of course had to get the dogs used to the idea. I was pretty confident that this wouldn’t be a problem since they had all gone on bike rides before. 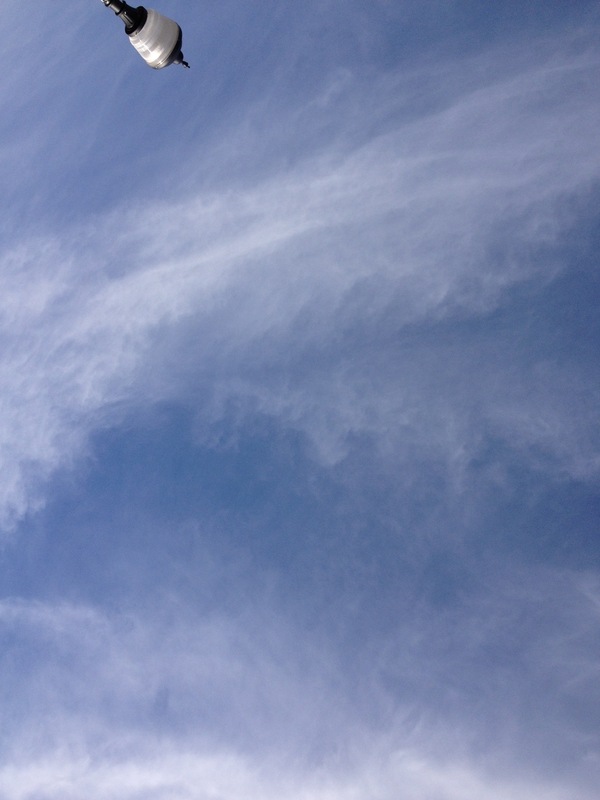 The web site where we ordered it recommended starting slow, hooking up the dog and walking before riding, and so on. Pretty logical stuff. It turned out I was a bit wrong about this. I tried Abby first. 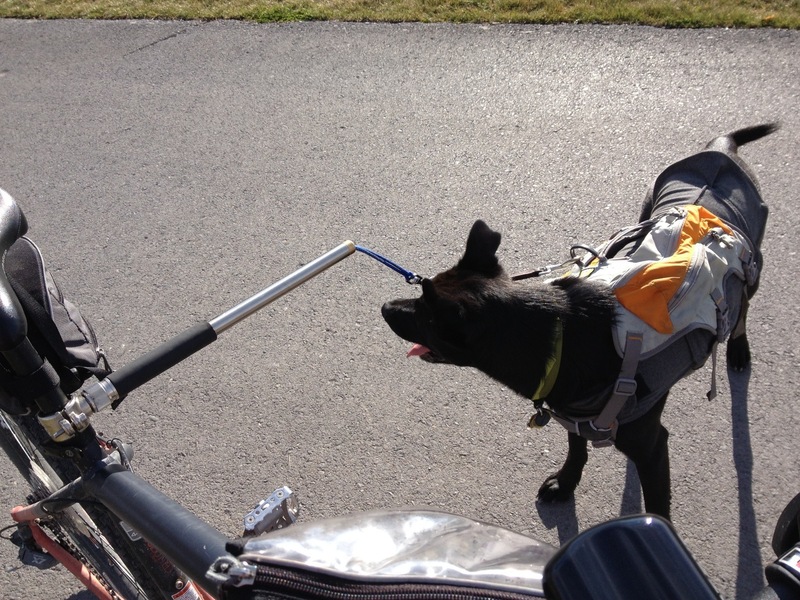 As soon as we got near enough to the bike for me to attach the leash, she started backing away. She refused to get close enough for me to connect her to the bike. So next I tried with Myka. 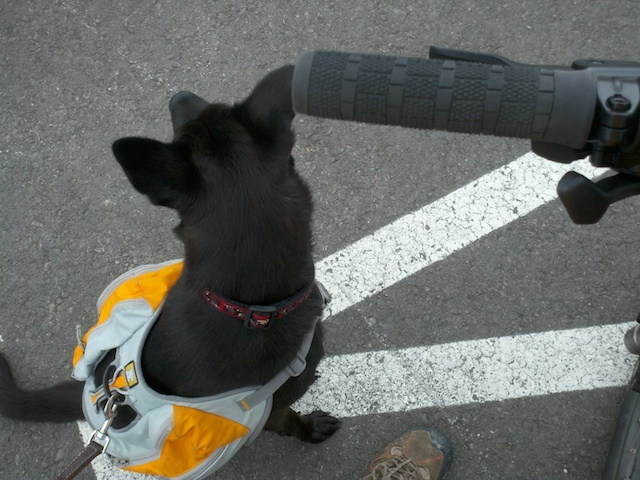 She also freaked out at first, and managed to wriggle completely out of her harness when I connected her to the bike! At this point, Renee came outside to help out. We spent some more time coaxing her to accept the idea. We managed to get her to go on a very short ride, first with Renee and then with me. My theory on why they freaked out is that they weren’t used to my bike (it is larger than Renee’s) and they weren’t used to the idea of riding with me, since Renee usually took them on her bike. So after the rather unenthusiastic response from the first two poodles, I really wasn’t sure what to expect from Darwin. He is, really, a scared-y-cat of a dog. Loud noises and strange things scare him easily. Clang a metal dog food bowl against the floor and he scrambles under the bed. Darwin waiting for us to start riding again. So with some concern I put the harness on him, took him outside and brought him up next to the bike. To my surprise, he stayed calm. Connected him to the bike and he just looked around as though saying “well? Are we going now?” Walked the bike around the yard once — barely — and then hit the street. He had no trouble at all, just started running alongside the bike like he had been doing it forever! 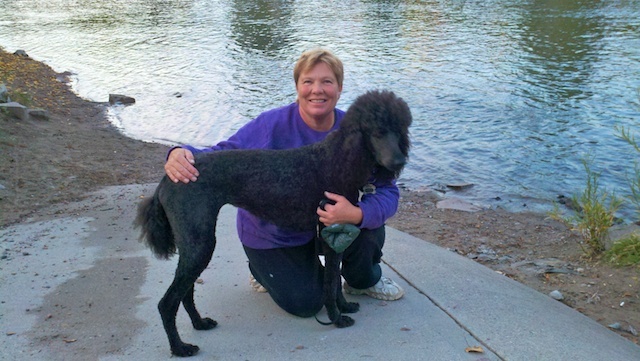 So although it was a mixed review from the poodles, Darwin gave the WalkyDog a full thumbs up. Since then, I’ve taken Darwin on many rides, sometimes with Renee and sometimes on our own. I’ve also taken Myka numerous times. Obviously, there are some risks when bicycling with a dog. All the risks associated with bicycling (traffic, road hazards, and so on) are compounded when you have a living creature attached to your vehicle and running alongside you. But you know, there are risks in everything. We could get hit by a bus while walking across the street. Our dogs could run off while hiking in the woods and get hurt. There are no end to the bad things that could happen. And the positive aspects of bicycling are just huge. The dogs love it. They get better exercise than on a walk, and they seem to love seeing us “run” at their same pace. 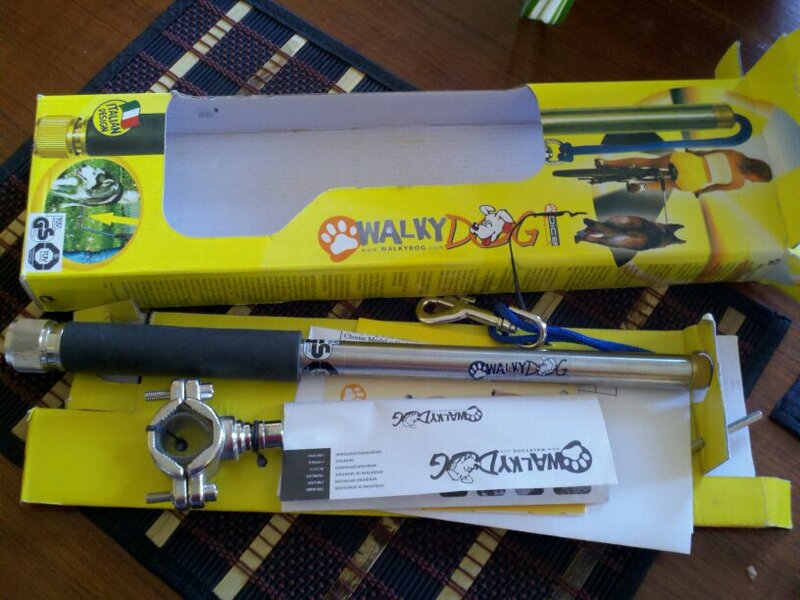 When I first started researching the WalkyDog before we ordered it, I saw a comment online (I can’t remember where) that said this was a terrible idea because it was essentially chaining your dog to a treadmill that could break his neck if he tried to stop. I sort of wonder about someone who says something like this. After all, the bicycle is not powered by some sort of inattentive robot. It should be powered by a human who actually, you know, cares about the dog running along and can pay attention to pretty obvious signals. The “treadmill” in this case can be extremely responsive to the actions of the dog. When I ride with a dog, the ride is all about the dog. I go the dog’s pace, not my own. When he slows down, I slow down. When he speeds up, I monitor his speed and make sure he’s not overdoing it, although sometimes it is amusing to just relax and let him tow me down the road. The point is, I’m not going to be getting massive amounts of exercise since I am constrained by the needs of the dog. I’ve found that it works well to position the WalkyDog so that it is almost perpendicular to the bike, but pushed back just a bit. In this position, I can see Darwin (or Myka) in my peripherial vision at all times. If he slows down and drops back a bit, I see the change immediately and can adjust. It is also necessary to be extra-alert when biking with a dog. For example, the other night we passed two skateboarders flying down the hill. Darwin doesn’t really like skateboarders very much — they move fast and they make funny noises. He wanted to chase the first one, and so I had to veer sharply the other way to get his attention and get him out of the way of the second skateboarder. I usually talk to the dogs quite a bit as we ride, which helps keep them calm and helps teach them what to expect. When we make turns, I call out the direction we are going. Both Darwin and Myka now know what “left” and “right” mean. Darwin also knows that “Let’s Go” means he needs to stop looking around at whatever is distracting him and keep moving. 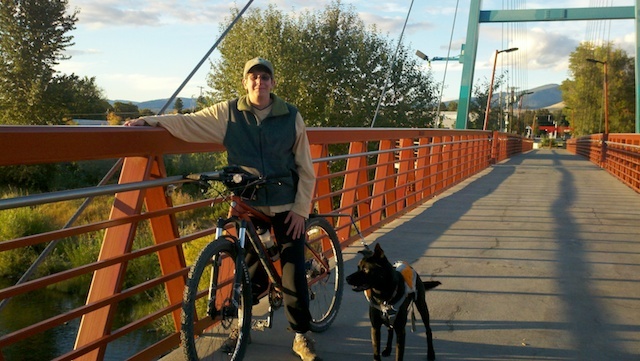 So far, in 2011 we’ve ridden about 120 miles with the dogs. A few of these rides were before the WalkyDog, but most were after. Sometimes we take two dogs at once, now that I can take a dog too. It is a little more chaotic with two, as they tend to compete with each other a bit. For example, Myka insists on being the lead dog. She does not do well if the other bike and dog are in the lead. The dog who has benefited the most has probably been Darwin. He can be a difficult dog these days. 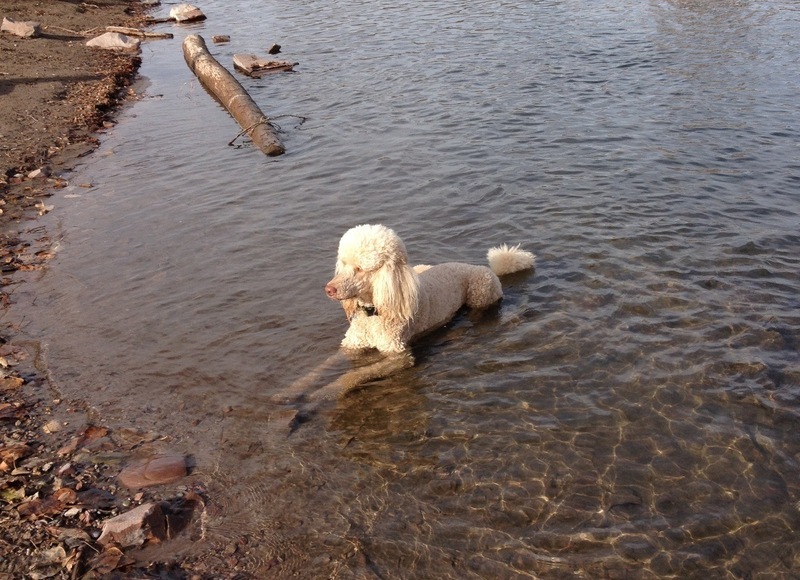 He loves the poodles and Cricket but is iffy with other dogs, so he can’t go to the dog park for exercise. With bicycling, I can take a short lunch break during my workday and give Darwin a good workout. Then in the evening we can take the rest of the dogs to the dog park. The best part of it all is, I usually come home from a dog bike ride in a good mood. Myka trots alongside Renee’s bike, sometimes glancing up as if to say “am I doing this right?” She is, of course. She loves running alongside a bike. It is an October evening. Cool, crisp, clear. It reminds me of why October is usually my favorite month. Not yet really cold, no longer the heat of summer. The scent of fallen leaves in the air. Renee and Myka are just a little ahead of me. We ride down Rollins to Beckwith. My pants nearly catch in the bicycle chain, so I pull them up to my knee and expose my leg to the chilly air. It occurs to me that this is very different from the bicycling I used to do, years ago. I was never a particularly fast cyclist, but I used to at least dress the part. Now I can’t remember the last time I wore bicycling shorts. I haven’t pulled out my road bike in ages…it is always the sturdy mountain bike, able to hop across potholes and stop suddenly if the dogs demand it. All my bicycling these days is always all about the dogs. We go at their speed — usually 6 to 12 miles per hour or so. We go just a few miles total. I love watching them trot along, so excited that we are finally going their speed, finally pulling our own weight and keeping up with the pack. Sometimes we each take a dog — Renee takes Abby or Sirus; I take Myka or Darwin. But tonight it is just Myka, out for some special one-on-one time. I love the fact that there is no planning, no preparing. We just finish up whatever we are working on, grab the bikes from the garage, a dog on a leash, and head down the street. Even wearing pants that you have to pull up to your knee to keep the cuff out of the chain. We leave the street at 1st street and turn onto the bike path. There is a bit of a hill here and Myka kicks it up to 15 mph. 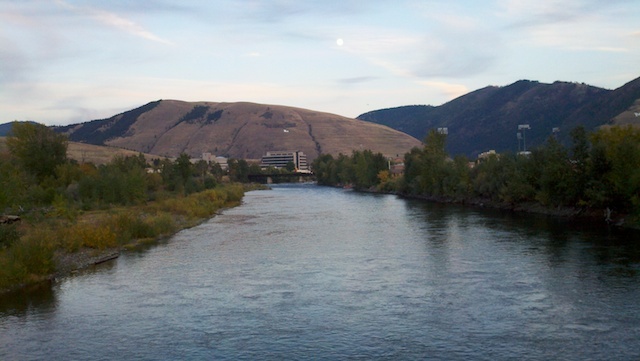 We cruise the rest of the way down to the river and head over to the Riverfront Trail Bridge. We stop at the middle to take in the river view. The area all around the bridge is littered with graffiti, but the view from the middle is great. Myka shuffles about on her leash. I take phone pictures, but she blends in with Renee’s black pants. Maybe I can fix the exposure on the computer later. It doesn’t matter. We soak in the view, then head back, turn our ride into a little 3+ mile loop. Myka adjusts back to her “prancy trot.” She is too cute; I wish I had a handlebar-mounted video camera. It is getting dark as we pull into the driveway at home. We have too much to do; cold weather is coming. We need to take the trailer in to be winterized. We should have packed it up today to get it ready, but we didn’t have time. We need to set up a tank in the greenhouse to save the pond plants before it gets too much colder. We spent the last month working on making a comfortable, warm home for the cats. It is overwhelming to think of it all. October is my favorite month, but it is brief and full of things that must be done before winter hits. It can be hard to stay in the moment and not panic. 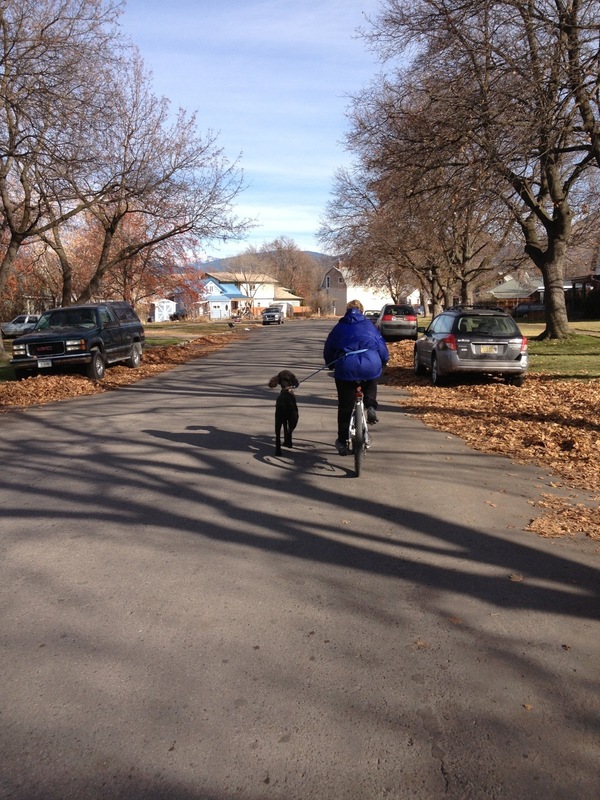 But right now, it is a perfect October evening and the most perfect thing to do was take Myka on a bike ride.